First off, there's the Extreme OC section that features the same "TweakIT" toggle switches as the original Rampage Extreme - this can overclock on the fly from within Windows or even when the CPU is loaded like in games. 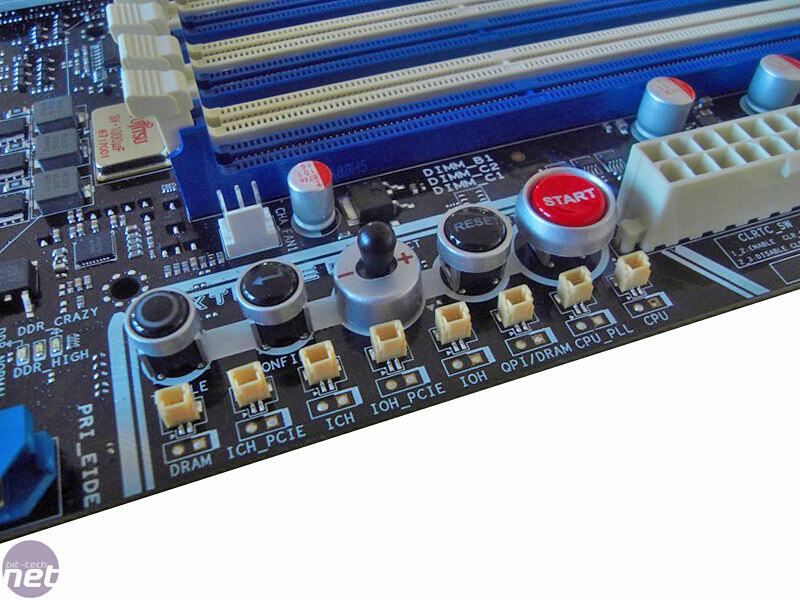 Below this are eight different pin-outs and solder points that allow multimeter readings of DRAM, ICH PCI-Express, ICH, IOH PCI-Express, QPI, IOH, CPU PLL and CPU voltages. Multimeter reading is considered pretty essential by many if not all of the more extreme overclockers out there, as reading BIOS voltages doesn't account for vDrop, vDroop and all other kinds of voltage nasties that need to be kept an eye on and scientifically reported and catalogued. 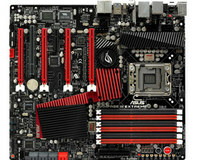 Another feature migrated from the original Rampage Extreme is the high density Fujitsu ML capacitors that are placed by the CPU socket and six DDR3 DIMM sockets. In addition there are the usual five million-squillion hour Fujitsu solid aluminium capacitors that are dotted around the entire PCB that improve the lifespan, voltage response and are generally a hotly contested feature between Asus and "the G-Team", whoever they are. 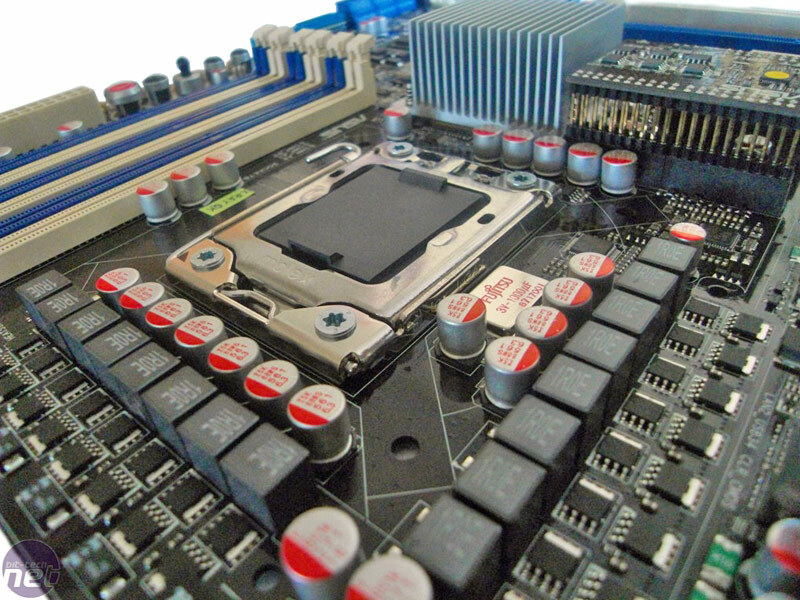 The CPU gets the now standard 16 phases as well as the EPU2 that switches between four and 16 - but god knows why you'd want to save power when you're hitting 5GHz while your elaborate multi-phase cascade is sucking down the juice like you've got a Meth lab on the go. The memory gets three phases while the northbridge and QPI also get three phase power regulation as well, just to keep things tidy. Aesthetically speaking it's got the same great looks as its parents - the Maximus II Formula and Rampage Extreme - with the silver, black and red heatsinks and nickel plated copper heatpipes. Some of us in the office don't like the pretence involved with signing a name on the southbridge heatsink, though. 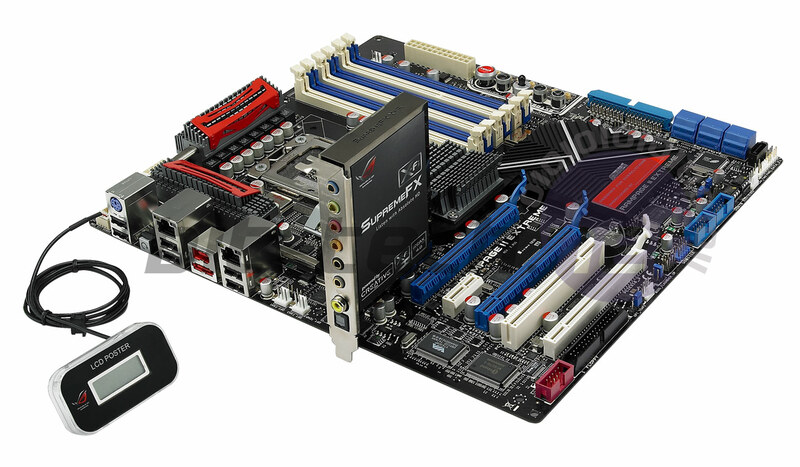 The board space isn't used uniformly like on the previous Republic of Gamer boards either, which makes it appear a touch hashed together around the ATX socket. Neither of the PWM heatsinks are removable this time, however the central heatsink over the X58 northbridge still is, and by the looks of it the area over the backlit RoG logo is as well. 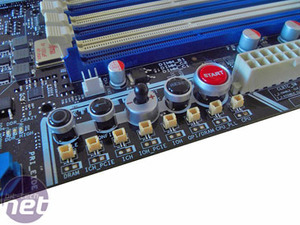 Not only does the board still have IDE, but a floppy connector as well - why? To further stick its thumb up a black hole, Asus has gone back to using the less than awesome JMicron controller to power it, rather than the Marvell one we prefer. 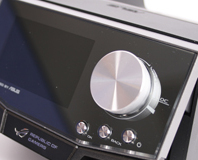 The same controller also offers another (black) SATA port and an eSATA on the rear I/O too. 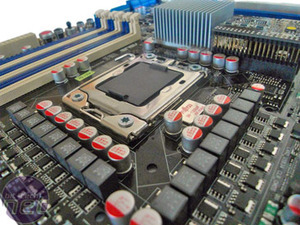 The usual six SATA 3Gbps ports from the ICH10R are inevitably there and well placed at 90 degrees to the board, but seven SATA ports is its limit. In addition there are a pair of IEEE1394a Firewire ports from VIA's VT8309P but no frilly extra's like ExpressGate which is good. In its place is the BIOS Flashback and dual BIOS function that allows users to chose which BIOS they want to boot from or flash to - allowing the testing of beta/custom BIOS' without permanently bricking a very expensive motherboard.